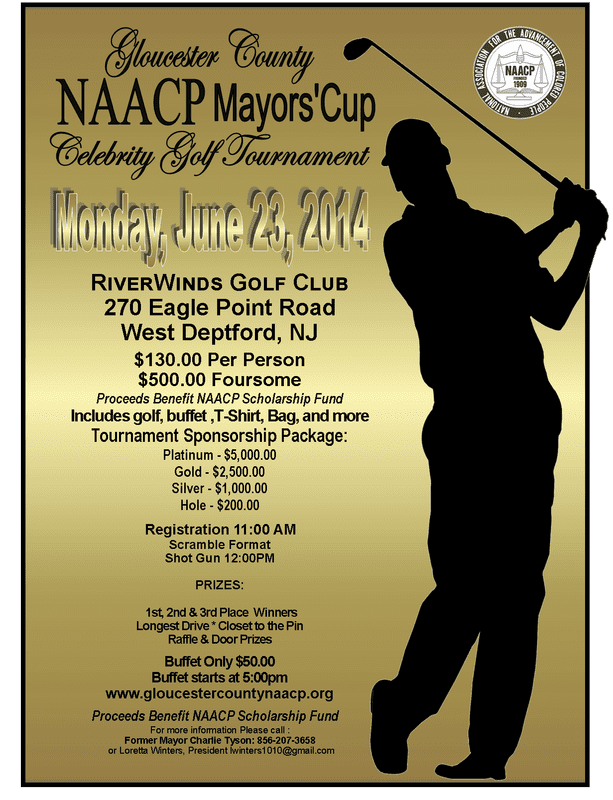 The Gloucester County New Jersey NAACP will hold their Annual Mayors’ Cup Celebrity Golf Tournament on Friday, June 01, 2018, at the prestigious Riverwinds Golf Course located in West Deptford, NJ. Michael Vick, former quarterback of the Philadelphia Eagles, Chazz Witherspoon, heavyweight boxer, Mike Rozier and many other pro players have join us in previous tournaments. These professionals have shared and supported our vision of promoting our youth. 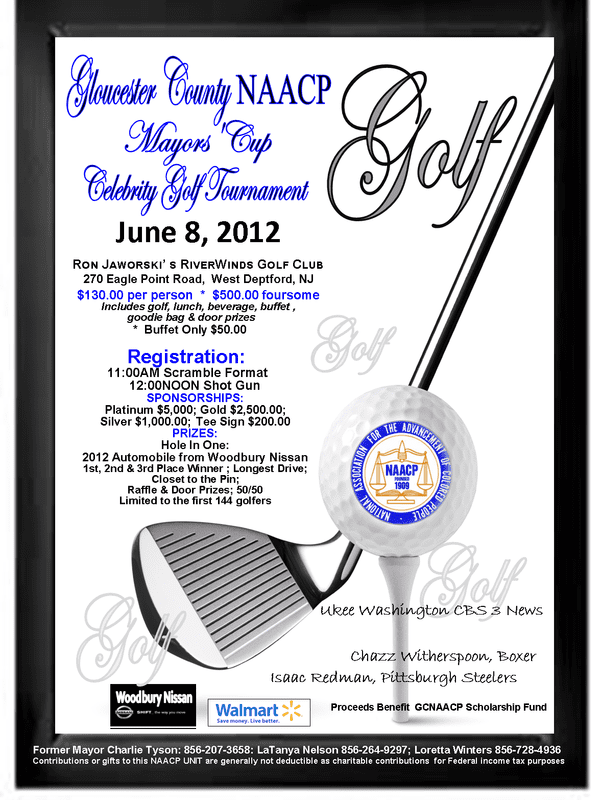 We welcome you to join us and consider being a sponsor of this fun-filled event for a great cause. Your participation as a sponsor will help Gloucester County’s youth through our scholarship program. Your financial commitment is a vital component in supporting and advancing the academics of deserving youth. The NAACP has been an avid leader of forging relationships throughout the community emphasizing that education is paramount. We stand firm in advocating for our youth’s education by supplying financial support through this scholarship endeavor. In 2017 we granted deserving students with cash scholarships and equipped each of them with an iPad mini. The recipients will receive their scholarships at the golf tournament during the presentation portion to begin at 5:30pm. As we continue to make plans for this prestigious event we sincerely hope you will respond favorably to our request no later than May 01, 2018. · Must be a minority as designated by US law or can show documented leadership endeavors in promoting diversity and equality. ESSAY—CHOOSE ONE QUESTION: A minimum of 500 words up to a maximum of 1,000. Must be in typed written format using proper grammar and punctuation. What have you learned from the movie “Selma” and how will it influence your life tomorrow? Is the NAACP relevant today and why?